Recently we were walking in the historic section of Newport. 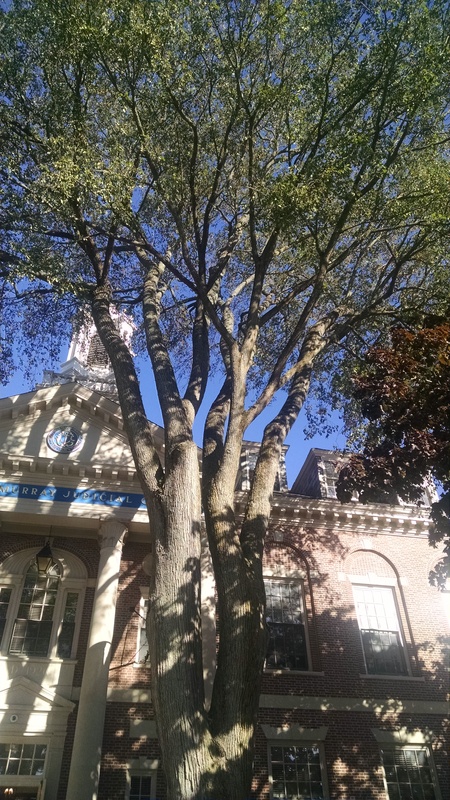 In front of the Judicial Center near the Old State House or Old Colony House[i] on the east end of Washington Square we chanced upon a mature eighty-foot American Elm. Once common along so many New England town commons and main thoroughfares, they are now a rarity, especially one as large and old: a true wonder and gift to behold. The spread of the nearly vertical clean main leaders and branches draws the eye upward like few other species do. Like Chartres or Notre Dame, they lift the heart and spirit. When I was first learning tree pruning crafts, elms were among the more challenging for neophyte nervous climbers. High unprotected foot-locking while gripping together two strands of climbing line to reach the lowest branches followed by some long, shin chafing, sweaty palmed scurrying up steep, sometimes slippery leaders made getting into one of these tall beauties uniquely difficult. But once tied into the sinewy, supple limbs in a secure upper central crotch, then balancing to reach outer limbs and swinging from limb to limb were exhilarating, unencumbered and fun. The scourge of Dutch Elm Disease in the sixties and seventies all but wiped them out. American elms form natural root grafts, so once one magnificent individual was infected, the fungus could infect the arteries (xylem in this case) of every elm with overlapping root systems and lay waste to a whole street. Unlike many other species, elm trees are particularly vulnerable because they transport their water and nutrients only in one outermost annual ring. Once those fragile single layer vessels are clogged with fungi, the elm was usually doomed. As I matured in my tree climbing experience, so did the disease spread, and I spent many more days taking down and destroying these beautiful dead creatures than pruning live ones. A chainsaw is a poor instrument for fine pruning. The elm bark beetle overwinters in dead elm trees under the bark and fungus spores are spread stuck to their bodies when the hatched mature beetles fly to bore into healthy trees in the spring to lay their eggs. A perfect symbiosis: the fungus needs live xylem; the beetle needs dead bark to protect its burrows and nests over the winter. The shared unlucky host is the dying elm tree. Cleaning up and getting rid of dead elm wood is one of the more effective preventatives in the losing battle against the disease, so we muscled them to the ground. To spot the yellow telltale flagging of wilting leaves on a tiny limb was a portent, dispiriting, like the long, meaningful, silent gaze of an oncologist when the biopsy results come back, preparing to deliver the bad news. Segue: The English word “truth” derives from the Old English “triewth or treowth” meaning trustworthiness, constancy or faithfulness. Ultimately it is believed to have descended from the ancient Indo-European word for wood or tree, “the semantic link being the firmness or steadfastness of oaks and such trees.”[ii] As the elm tree is perfect, true, consistent and faithful to its purpose, so, too is objective truth. As the elm tree dies of its own vulnerability and a tiny spore, so too in post modern times does the concept and common value of “treowth.” Truth has devolved to whatever is necessary to achieve the ends of the definers. In 1948 to brilliant minds like Orwell’s, the future degradation of language was clear. No longer do news media, politicians or bureaucrats write the truth or even the facts as they understand them. Language is persuasive; symbolic acts are persuasive; film, music, political discourse, fiction and non-fiction are persuasive and always in service of the chosen narrative, the agenda. Whatsoever advances persuading others to strengthen the agenda is right. Right, objective right, what we ought to do to be true to the facts is secondary even accidental. Such adherence to fairness and objectivity is considered foolish, or worse, a betrayal. It does not even matter really if we convince others to change their minds, but we must stay safely in our concurring herd. To suffer rejection and mockery because we speak in criticism of the current accepted normality, no matter how abnormal, is our deepest fear. We speak and write and post bullet point posters to gain “Likes” from the likeminded. The Kavanaugh circus is the latest episode. Someone’s lying, and it doesn’t matter so long as the agenda is promoted. That Senator Feinstein and her gang of bushwhackers held on to the letter from Dr. Ford with the uncorroborated accusations of sexual assault for over six weeks was part of the ambush. Grossly unfair to Justice Kavanaugh with the eleventh-hour sandbag job, and grossly unfair to Dr. Christine Blasey Ford because, while it riled up the likeminded in the media, filling all with self-righteous indignation, the surprise attack time frame left few prospects for proper investigation and vetting. Dr. Ford was left naked in the public square by her allies and the circling hyenas surrounding Kavanaugh, who were only interested in embarrassing the judge, undermining fair due process and stopping the nomination at any cost. Including awful cost to Dr. Ford: whether she is believed or not, her life is irretrievably changed. The truth, the true facts had nothing to do with the cauldron or the agenda. Then we had the box of coat hangers delivered to Senator Susan Collin’s office. So many lies in that box, it’s hard to sort them out, but the nearly unbearable pressure was clear. Vote to confirm Justice Kavanaugh and soon will follow thousands of butchered and maimed women abandoned on bloody kitchen tables. That Kavanaugh would be one vote of an impossible to predict nine was not a consideration. Forty-five year’s weight of stare decisis since Roe v Wade was not a consideration. Should the extremely remote possibility of a reversal or a curtailment of the most liberal abortion ruling in the world occur, the law would revert for the states to establish in their various jurisdictions, and the great majority of the states allow abortion in almost all circumstances. Voters could vote. None of the facts mattered, only the emotional bludgeon. Fair minded? Principled? Thoughtful? What we say we want in our leaders, but rarely support in practice? Yes, yes, yes and yes. Senator Collins supported both liberal Justices Kagan and Sotomayor. She voted to sustain the Affordable Care Act. She voted for the largest government stimulus in our history submitted by President Obama. But when she held to principles, fairness and thoughtfulness with Judge Kavanaugh, that is the unforgiveable sin to the pack that wants to run her down and tear her to pieces. Such is the fate of treowth tellers. I so appreciate this piece. I sent Senator Collins an email telling her she was the bravest woman in America last week. Being from the west coast, I was not familiar with her personality and wondered if she would be able to withstand the onslaught. She did, was fair minded and like the rest of us, refused to allow a person to be destroyed by unsubstantiated claims. We now live in a world where the mob wants to rule whether they are right or not. It reminds me of the mobs during the French Revolution. They caused murder and mayhem because they were spurred on by their worst selves. They did not pay attention to the facts, only to what they wanted! Thank you for writing this piece! In Rhode Island with a population similar to Maine, we elect the likes of Sheldon Whitehouse and Linc Chaffee, perpetual embarrassments. Whitehouse was among the chattering herd on the Kavanaugh nomination. Great piece Jack, as usual, well written and spot on. In todays political and journalism environment the truth holds little to no relevance to the data disseminated by the left and main street media. I have never heard, in my lifetime, any politician encourage their supporters to “get in the face ” of the opposition…..from either side. Thanks to Maxine Waters for that approach, if there ever was a more witless and punitive jackass elected by free people, I don’t know who that would be. She actually makes our dreadful Sen Warren seem well……… not as bad as it could get….but close enough. I can’t remember who coined this phrase but it has never been more relevant. “If you don’t read the news ( or hear it) than you are uninformed, if you do read it you are misinformed.” Now ain’t that the truth? Sad story about the trees and I feel always feel more highly educated after I read your yarns………..good stuff! Quo Vadis? Jack's Blog · Random ruminations on where we are going and where we have been.